Why Did I Read This Graphic Novel? I initially became interested in The Raven’s Child by Thomas E. Sniegoski illustrated by Tom Brown because of the way that it was pitched to me. It was described as being a sort of Buffy The Vampire slayer meets dystopian end of the world with aliens. That actually is kind of what it is, but yeah, a description like that and I cannot help but say YES PLEASE I SHOULD VERY MUCH LIKE TO READ THIS THING. Of course, it ended up on my readathon pile because it is a graphic novel and those are the fastest reads ever and it also features monsters which is perfect for that Halloween type mood that I have going on over here. The Raven’s Child by Thomas E. Sniegoski illustrated by Tom Brown makes me immediately think of that phrase ‘O! How the mighty have fallen.’ You see, in this book an alien race known as the Throng have taken over Earth and there are brief snatches of humanity here and there, but mostly, man has fallen. Whether this is due to hubris or something else, I do not know. The book does not entirely get into why we are into the last grasps of humanity. Especially because now that I think about it, if there were aliens that invaded, wouldn’t we just bomb them back into whatever planet they came from? Okay, I am digressing here. Okay, so there is not exactly a lot of hope for humans. One day, this girl, Kiley is out walking the streets with her baby brother, when she is attacked by the Throng. It all looks to be over when she is saved by a heroine, who calls herself The Raven’s Child – playing off religious belief held by the Throng. She is an incarnation of a prophecy and here to judge the Throng. She also is a human girl named Carissa, who is about to become legend, simply by playing off ancient fears. This Raven’s Child inspires the humans to begin to fight back, even if it means losing their lives, because what kind of life is it to hide out all the time? How Did I Like This Graphic Novel? I feel a little bit bad typing this but honestly, I did not love The Raven’s Child. I mean the story is cool. The art is good. However, it just felt like it took an excruciating amount of time to read. I will admit, I usually whip through graphic novels, hence why I pick them out to read during Readathons. This one took my hours to get through. I am not entirely sure why that is. There was just something that was off to me about the pacing – to the point where I chose to watch silly videos on vine instead of reading. However, I am a sucker for uprising stories – especially when it is collective humanity uprising against monsters. I also like when religion is inserted into books – fictional religion I mean, not like reading religious books. So, I thought these cultural elements were really neat. I loved seeing the whole guerilla aspect of the book and how Carissa’s actions inspired others. 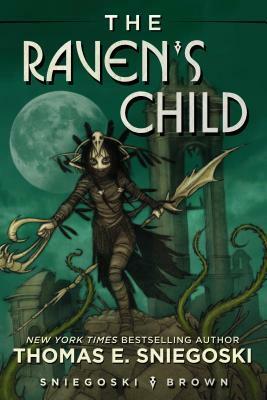 I think that if not for my percevied pace issues, I would have really loved The Raven’s Child. My boyfriend and I both read this graphic novel and this is the point where we disagree. I actually really liked Tom Brown’s artwork in The Raven’s Child. I thought it was quite detailed and liked how the use of grayscale reflects the bleakness of the book. I liked the details with regards to the throng. I also liked how the people were illustrated – especially their eyes which came across as really expressive. So many tentacles in this book. I totally would except ugh, aliens. Cute gif though!